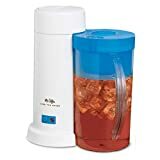 ICED TEA MAKER, two-QT., BLUE TM1 Fresh, residence-manufactured iced tea has by no means been less difficult making use of the Mr. Coffee® Fresh Tea Iced Tea Maker. Use tea bags or tea leaves to develop refreshing iced tea drinks, no matter whether you prefer classic unsweetened tea or gourmet-infused flavors. Just add water, tea, ice, flavor substances and brew! In about ten minutes you can be sipping your custom-brewed iced tea. Tends to make up to 2 quarts and automatically shuts off right after the cycle is total. Skip the coffeehouse and enjoy fresh iced tea at home. Recipes integrated.